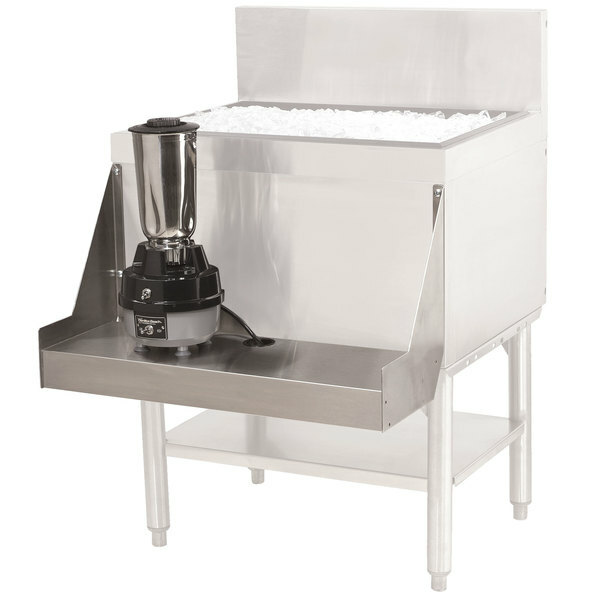 Ensure convenient access to your commercial bar blenders with this Advance Tabco PRA-BS-24 Prestige series stainless steel blender shelf! This blender shelf works with your line up of Prestige underbar equipment to provide steady support for your blenders within close proximity to your supply of ice and beverage ingredients. In addition, it keeps your blenders at the perfect working height for comfortable use. Made of stainless steel, this blender shelf is designed to hold up to use in your commercial bar environment! This shelf attaches with screws to the front apron of your Prestige bar equipment and comes equipped with a duplex electrical outlet that is hidden underneath. A pre-cut hole allows convenient access to plug in blender power cords and keep them tucked away out of sight. Most Prestige series equipment that can accommodate this blender shelf will have a full front apron and predrilled holes with threaded inserts. This makes it easy to install this shelf in the field. Some equipment may require holes to be drilled in the front apron prior to installing the shelf. Front to Back: 9 3/4"